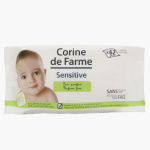 Corine De Farme Sensitive Baby Wipes - Set of 62 | Multicolour | Alcohol Free. Use this set of baby wipes for your kid and let the child enjoy the process rather than feel irritated. The wipes are soft and gentle even on the sensitive skin and provide the baby's dry skin with moisture.